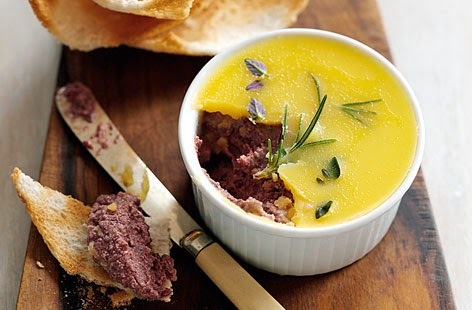 Our chicken liver parfait never fails to impress and, luckily, it's easy to make at home. Why not make it for friends and family this Christmas for a Christmas gift with a difference?! Store it in small Kilner jars with a ribbon to ensure it really produces the wow factor. 1. Fry the onion and garlic in a large frying pan over a low heat with a little olive oil until the onions turn translucent. 2. Turn up the heat a little, add the livers and cook until just cooked through. 3. Add the brandy and simmer for a couple of minutes. 4. Tip the contents of the frying pan into a food processor and blitz until completely smooth. Season with salt and pepper. Add to your Kilner jars, ensuring you leave at least a cm for the clarified butter topping. 5. To make the clarified butter layer: melt the butter over a very low heat. When it separates, spoon the clear butter over the parfait, making sure you don't add any of the small white bits. Your parfait will be ready in an hour and will be good to eat for a further 2 weeks, due to the layer of butter.